Watching this video of Sheikh Zayed is like time-travelling and witnessing him speak. 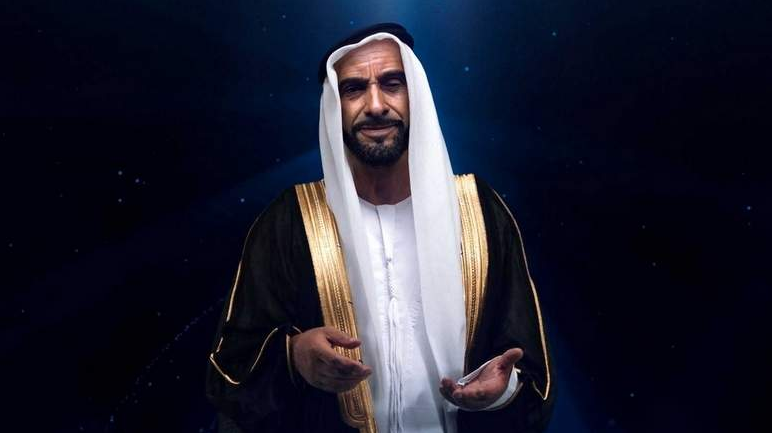 Have you watched the recently-released video 3-D photo-realistic hologram of Sheikh Zayed yet? It’s a meticulously crafted video that captures the Sheikh Zayed’s tone of voice, facial expressions and hand and body gestures in stunning detail. Currently being streamed at the Mohammed Bin Rashid University of Medicine and Health Sciences in Dubai to commemorate the 100th birth anniversary of the founding father, the video is four minutes and five seconds long. Released at the opportune time (The year of Zayed) the video was originally posted on Vimeo and has gone viral with more than 65,000 views online and numerous likes. According to Hasan Hina, Co-Founder and CEO of NDP (the company that developed the video), the motivational quotes that have been heard before have been aired side by side for the first time. “This is actually something we haven’t heard before in this sequence. We brought some of his most famous quotes into one dimension. Consider it as his best quotes brought together to create his best speech. It’s the first time people are hearing it in long-running format,” Hasan Hina told Khaleej Times.